We know that people are the largest source of gas emissions, with a majority of greenhouse gases coming from us burning fossil fuels for heat and transportation. These emissions led to global warming, which in turn increased the temperatures of our ocean water. Earlier this year, we saw the consequences of having warmer oceans when Hurricane Harvey struck Houston, Texas. Due to Harvey’s presence, a significant number of homes and buildings were damaged, flooded, and lost. Needless to say, we’ve only reached the cusp of this dangerous series of events, and catastrophes are sure to worsen until proper measures to reduce carbon emissions are put into place, and most importantly: enforced. But waiting for the world to come to its senses isn’t the only option people have to reduce our carbon footprint. 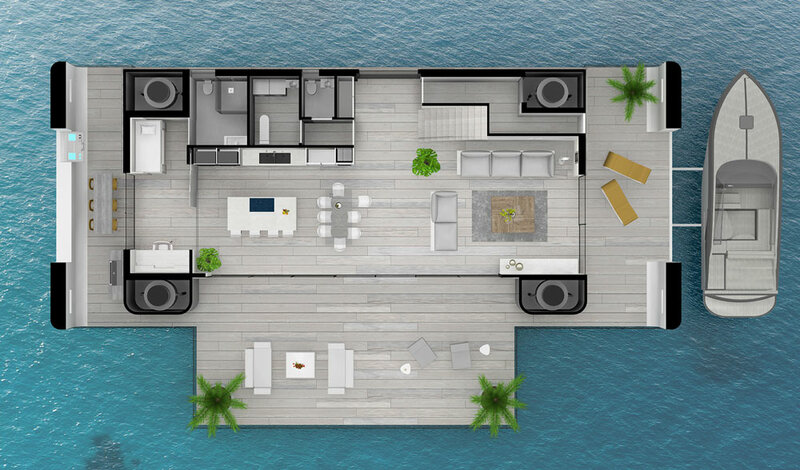 Some, like Dutch architect Koen Olthuis, have taken to designing homes located on the water — homes that not only produce zero-emissions, but are also hurricane-proof. According to Inhabitat, Olthuis — with his studio Waterstudio — collaborated with “avant-garde life on the water” company Arkup to design the floating homes. Each unit is about 4,350 square feet, with Olthuis and Arkup’s latest structure containing 4 bedrooms and 4.5 bathrooms. Through a combination of solar panels, as well as water purification and waste management systems, they can operate entirely off the grid. The livable yachts come installed with 30-kW solar panels and 1,000 kWh of lithium-ion batteries. Rainwater is collected on the roof and transported to the home’s hull, where it’s then purified for future use. There’s also plenty of space to comfortably move around, including the 24×12 foot sliding terrace that lets you step outside and enjoy the view. Arkup says its yachts are “a new way of living on the water, making you feel 100% safe and protected,” and we’re inclined to agree. Each home is equipped with shock-resistant glass panels to prevent shattering, and a hydraulic self-elevating system that can raise the home in the event of heavy rainfall or a hurricane; each hydraulic leg can also extend up to 40 feet. If that wasn’t enough, the hydraulic legs can move the unit at a speed of 7 knots (8 mph). It’s a stylish way to live on the water, and yet another example that the homes we choose to live in can positively affect our environment. The white forest tower in Parisis further proof of that, as are the wooden skyscrapers and plyscrapers that are expected to reduce our carbon emissions. Only time will tell how effective such structures will be, but if the price is right, we could come to live in a world where a majority of us live on water instead of on land.